Volvik golf balls will now be entered into my best golf ball challenge. 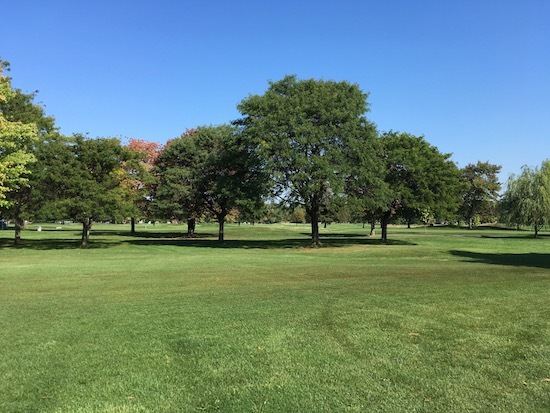 Just like with all of my reviews, I play one 18 hole round at Rackham Golf Course near my house and report my findings after the round. Every time I play a Volvik golf ball I will update the results here. Golf balls have been around for a long time. And while golf ball technology has advanced over the years with multiple layers, dimple sizes, and materials used on the inside, it appears not much has changed on the outside. At least for me. The covers feel almost the same. Kind of like comparing a Miller Lite to a craft beer. They can be close in appearance but after one taste you can tell which one has had more effort into making it. And that is what the Volvik Vivid golf ball is. It’s the worlds first ever matte finish golf ball. I picked up a sleeve of Vivid’s at Carls Golfland with a gift card I had along with a couple other sleeves of golf balls. I first heard of the Volvik Vivid when Bubba Watson made the switch to them last year. But it wasn’t until I was in the golf store and felt the matte finish that I knew I had to try them. On the sleeve it says the Volvik Vivid provides “less glare for increased visibility and focus, ultimate distance with a softer feel and greater energy transfer from the Power Dual Core, and added visibility and better course management and ball striking due to unique color enhancement.” Ok. Lets see what you got. 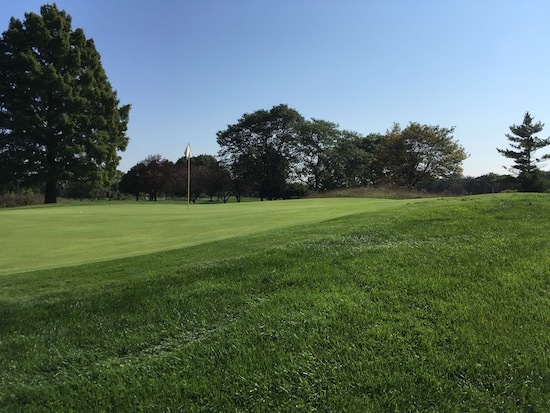 Off The Tee – Hit four fairways today which is below average. Zero times did I hit a draw nor did it slice which agrees with what Volvik claims. I did have three hooks that still went far. Outside of one straight drive, everything else pushed a little to the right. Distance wise they were ok. All of my well struck drives ended up in spots I hit from with similar golf balls that are not overly marketed to be “distance golf balls.” I’d say similar to the Titleist NXT Tour. What left a lasting impression with the Vivid was how soft it felt leaving the drivers club face. It’s as if you could feel the driver compress through the matte finish and then make contact with the harder inner cores which delayed the sound from contact. Even the guys I golfed with said the same thing. Fairway Woods & Hybrids – Fairway woods and hybrids had a similar compression and feel at contact, delayed sound, and very little spin left or right. I really enjoyed hitting the Volvik Vivid with these clubs for that reason. I hit a number of 3 woods, 5 woods, and a couple of hybrid shots today. What made a lasting impression for me was how it was not long but was accurate and soft when it landed. The Vivid did not roll that much after landing. My best example of its lack of distance is on the Par 5 7th which is a slight left dogleg. I hit a great drive down the left side of the fairway which shaves distance to the hole. Typically I land on the right side but am 20 yards further away. Hit 3 wood like I normally do at the green. I know it wasn’t going to make it but when I got to the ball it was 35 yards off the green. If my drives with the TaylorMade TP5x and Nike PD Long would have been on the same line (ended on the left side instead of right) as the Vivid then I would have been able to reach the green in two with both. Irons – This is where the Volvik Vivid shines. I don’t know why but I feel the Vivid plays longer with the irons than most. And the soft initial compression at contact is just awesome. It’s as if the matte finish mashes into the grooves of the irons, disperses itself to get solid contact, loads, and unloads when you hit the harder inner cores. How it flew and landed were neat too. I had a couple of full iron shots where I could see the ball doing one of those “figure 8’s” (where it starts right, draws, and keeps drawing, ending up spinning back to its starting point). And when it landed, it landed soft. My guess is the matte finish has something to do with it. The Vivid feels lighter in your hand than every other golf ball with a regular cover. When the Vivid was descending it turned into a feather and just kind of falls. Very little run off. Very small ball marks. It was like that all day. Just the right amount of backspin. Wedges – This was another bright spot with the Vivid for me as the spin I was getting was higher than most. It has to be the matte finish again. When you hold the Vivid it has a “grabby” feel to it. I can recall four wedge shots where the ball took the “figure 8” flight again. And I’m talking from 30 to 90 yards. Never in my left have I seen that sort of ball flight from such a short distance. It was kind of cool to see. Even my one bunker shot checked up on the second bounce saving it from rolling out another four yards on the green. There was an almost instant comfortability hitting full pitching wedge shots and chip shots with the Vivid as it landed soft every time. I got up and down for par three times which is above average for me. Putting – And this is the one characteristic of the Vivid that I do not like. That “grabby” feeling happened on every single one of my putts. On 100% of putts longer than 10 feet you could hear the ball grabbing the green as it made its way towards the hole. The guys I was golfing with said the same thing. I have never left so many putts short in my life. I took 35 putts today which is average for me. In those 35 putts were 4 three putts and 5 one putts. What is most sad is out of those 4 three putts, I was putting for birdie on three of them. The lasting impression I have about putting the Volvik Vivid is how it grabs the green. I cannot remember a ball ever making that sound or a sound when it was supposed to be accelerating, not already decelerating. Saying that, I did one putt 5 times resulting in two birdie putts made from about 10 feet. The others were the results of good chips also landing within 10 feet. I just kept telling myself to hit it a little harder. Most of the times that worked and it stopped close. Most of my three putts were due to me being 35+ feet away on my first putt. Durability – The most durable golf ball I’ve ever played. Hands down. I did lose one on #17 after hooking my drive into some tall grass. But before I lost it there was not a blemish on it. Did not hit any trees and only one shot out of the sand trap. The matte finish is awesome in this regards. You would have to be hitting a lot of cart paths and trees to beat the Volvik Vivid up to the point where you would not play it again. DO NOT BUY THE BLUE VOLVIK VIVID. You will not be able to find it. Look at the pictures below and try to find it. I’m 30 yards from the ball. Do you see it? Zoom in. It’s in the center of the picture. In the middle of the fairway. Notice the white ball on the green 30 yards away. But do you see the blue Vivid 5 yards in front of me in the rough? It became a little annoying trying to find the blue Vivid throughout the round. I was asking the guys I was golfing with to help me find the ball on almost every shot that was not in the fairway or on the green. The problem was as soon as I hit it, the blue Vivid would blend in with the sky and I would lose sight of it when it made its descent. I could see the direction it was heading but could not tell how far it went. 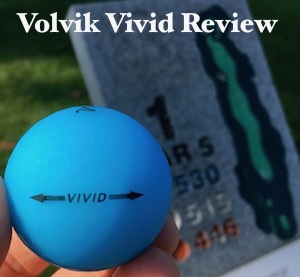 The next Volvik golf ball I buy will be any color but blue. What I will finish with is I really liked the Volvik Vivid. It played like no other golf ball because of the matte finish. It was refreshing to play a good all around golf ball as in my previous four tests I played the XXIO Aero-Drive, TaylorMade TP5x, Nike PD Long, and Titleist Velocity. All of which are designed for distance first and everything else second. I shot 86+ with those four and with the Vivid I shot 81.